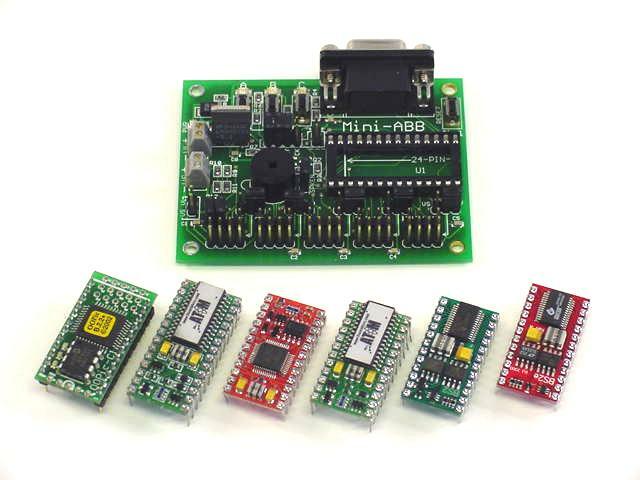 The Bot Board II is a carrier for the Basic Atom microcontrollers. The carrier will accept any 24 or 28 pin BS2 like controller, however, we have designed it to take advantage of the Basic Atom's special features. Speaker We added a buffered speaker for all of those sound generating commands such as SOUND, FREQOUT, or DTMFOUT. User Interface We multiplexed three Pushbuttons and three color LEDs on three I/O pins to make a simple user interface. PS2 Port We added a Sony PS2 game controller port for BA users. Powering Options The board has two power inputs. One for the microcontroller, and one for the servos. The micro can be powered from its input, or the servo power input. Analog Inputs By adding shorting jumpers you can route the power inputs to the A to D inputs for battery status monitoring. I/O Bus The I/O bus is designed in groups of four, with a row of I/O pins, a row for power, and a row for Ground. The power row is jumper selectable to carry 5vdc or the servo voltage. The board has small screw terminals for applying power, so there is no need to solder wires. We have lots of peripherials that plug right into the I/O bus, with many more in development. The Basic Atom Pro has a new command called HSERVO. It can do all of the servo timing, (1.0 to 2.0mS), as well as sequencing of servo moves, in the background. This is a full featured multichannel variable speed servo controller, that's "built into" the microcontroller. It's like getting a free servo controller! However there is no serial data bottleneck. All of the servo control is as quick as changing a variable within your behavior program! 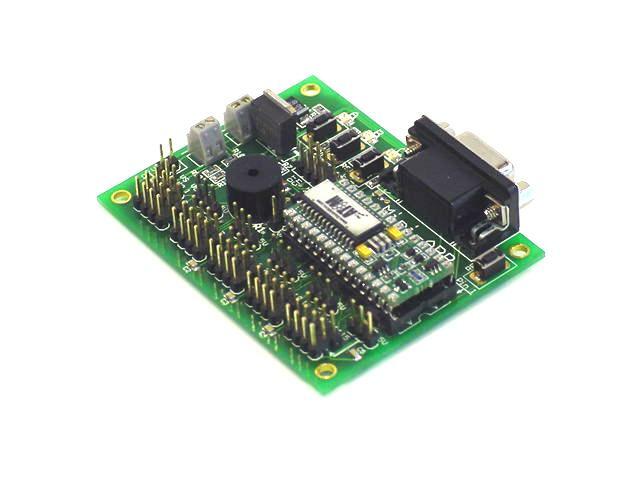 The Bot Board II is the best carrier board for the Basic Atom, or any other 24 or 28 pin microcontrollers. It's perfect for controlling your small robotic projects. It has an onboard speaker, three buttons and LED's, a Sony PS2 controller port, a reset button, logic and servo power inputs, an I/O bus with power and ground, and a 5vdc 250mA regulator. Up to 20 servos can be plugged in directly. We have many plug and play peripherals as well.